Posted Thursday, March 20th, 2014 by Greg Gladman. You take pride in your work, and your office is a place where you spend a lot of time. It is a place where you generate ideas, get productive, meet clients or put your creative muscles to work. You put so much creative power into your work. Let us get creative with your work space. We’ve got a few ideas to get your started in creating your personalized work space. From the small details to the decorations and the final look for your office, you will want to check these inspiration boards out on your next coffee break. It’s all in the details when your creating a space that suits you. Post-its and paperclips have their place in a functional office, but don’t be afraid to add your own touch. Check out a few of these office supplies and get inspired. 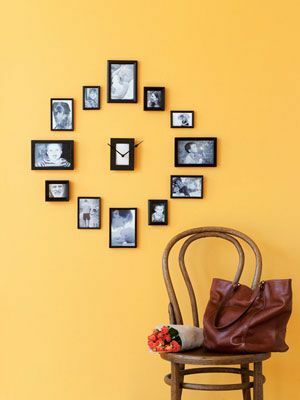 Let your office decorations reflect more aspects of who you are, like this clock composed of family photos. After all, the work that you do is inspired by the whole of your life. Unique designs can also serve to keep you focused and on task. And staying organized can play into decorating your office space as well. Need to see the big picture before you get started organizing and decorating your own space? Here are 25 home office designs we think you will want to see. Take a look. Get inspired. Get to work! More inspiring tips for your office can be found by visiting our 4 Office Tips to Save You Time and Increase Productivity blog post.